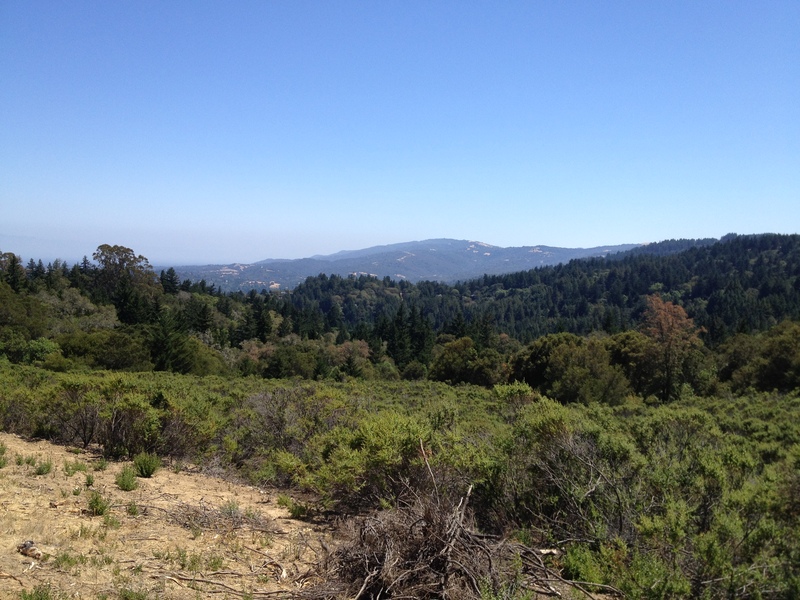 Hikerly — Wunderlich County Park Loop, 5.5 miles - 1153 ft.
Browse: Home / Wunderlich County Park Loop 5.5 miles – 1153 ft.
Wunderlich County Park in San Mateo County is a gem of a local hike spot with history. In addition to numerous hiking trails through redwoods, madrones and open meadows, there are beautifully restored estate buildings from the former Folger family ranch (yes, as in the coffee) which house a museum and active horse stables. This particular loop hike gets the thousand-plus foot climb out of the way in the first half before meandering back downhill. 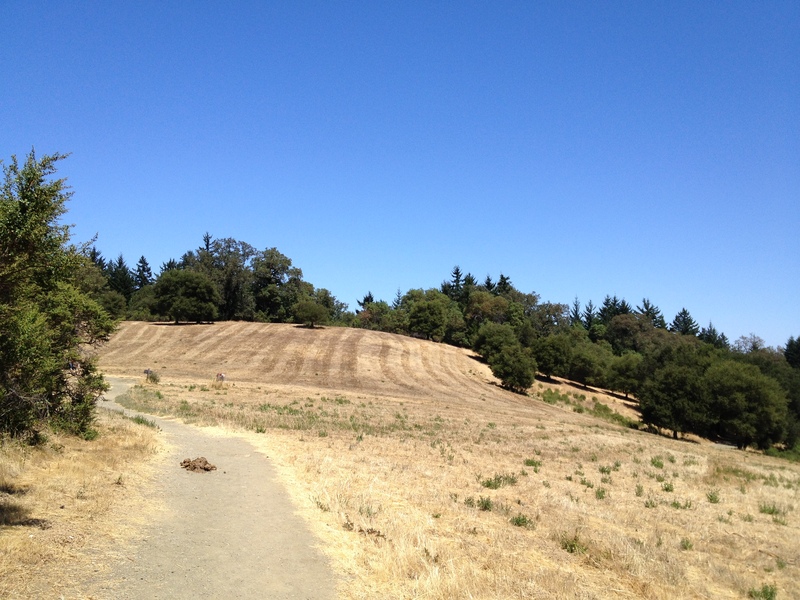 Highlights of the hike include views of the San Mateo countryside, some gorgeous meadows atop a ridge and Salamander Flat, a former irrigation pond that is now the breeding grounds for rough-skinned newts. The trails are shared hiking and equestrian trails so you may pass some horses along the route, though we found hiking in early afternoon to be relatively horse-free on a recent Saturday, likely as the horse riders were avoiding the hottest part of the day. Be sure to leave enough time to enjoy the museum near the trailhead as well. 1. From the parking lot, you will see the museum buildings up the hill along a service road. The Alambique trailhead, however, is on the south side of the parking lot. There is a portapotty near some picnic tables by the parking lot as well. This is the only bathroom on this particular hike. 2. Follow the Alambique Trail as it ascends through a forest of redwoods and oak trees, following the signs toward Alambique Flat, a somewhat non-descript flat area with room to sit on the dirt ground off the trail edge. If it’s a hot, sunny day, it makes a decent spot to stop in the shape for a bit to eat, but on cooler days I’d recommend continuing to the meadows where there are benches and majestic views before taking a lunch break. 3. Just beyond Alambique Flat, take a left on Skyline Trail for a short .2 mile connection to the next trail. 4. Turn right on Bear Gulch Trail toward The Meadows, a beautiful grassy knoll [photo] atop a hill with views of the rolling hills of San Mateo County to the east [photo]. There is a bench in The Meadows if you want to stop here for a rest after that uphill climb. From here you’ll begin your descent back down the hill. 5. In The Meadows you’ll take a right on Meadow Trail, heading downhill from here on out. 6. At the intersection with Oak Trail, continue on Meadow Trail as it veers to the left. The signs start getting amusing here on out as you come to intersections referencing the parking lot in several different directions and at different distances, like some Alice in Wonderland mind trick. This is because numerous trails here intersect with each other so you can loop around in many different ways back to the parking area. 8. 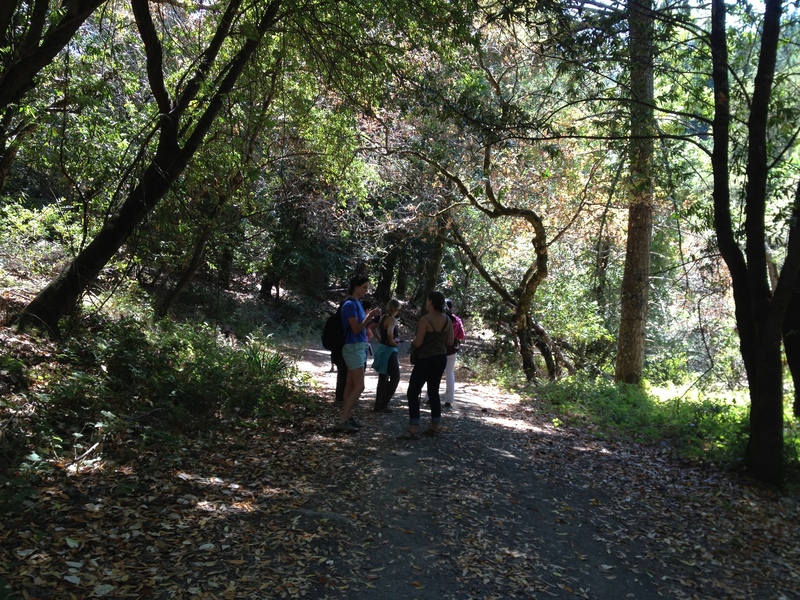 Continue on Madrone Trail for another .6 miles after Salamander Flat. Be sure to look around an enjoy the peeling red-barked madrone trees lining much of the trail. 9. Make a final right on Bear Gulch Trail and follow this roughly .7 miles back to the parking area. All of the trails on this loop, with the exception of the Bear Gulch Trail, are shared equestrian and hiking trails. That means the trails are fairly wide and well maintained with gradual though steady inclines. It also means you’ll need to watch your step for horse leavings along the trail and keep an eye out for the actual horses on the trail. Horses can get spooked so trail etiquette is for the hiker to give right of way to the horses. If you are passing equestrians simply move to the side of the trail and wait for the horses to pass before moving on. I have read in other blogs that the trails can be pretty crowded with horses, especially on weekends. However, on my recent Saturday visit in the early afternoon, we hardly saw any horses on the trail, most likely because it was the hottest part of the day. One of the great things about this park is its history and the chance to take in great views and a great museum and historic site. Be sure to go into the museum to learn more about the park and talk to one of the well-informed docents. Here are just a few little tidbits to whet your learning appetite. 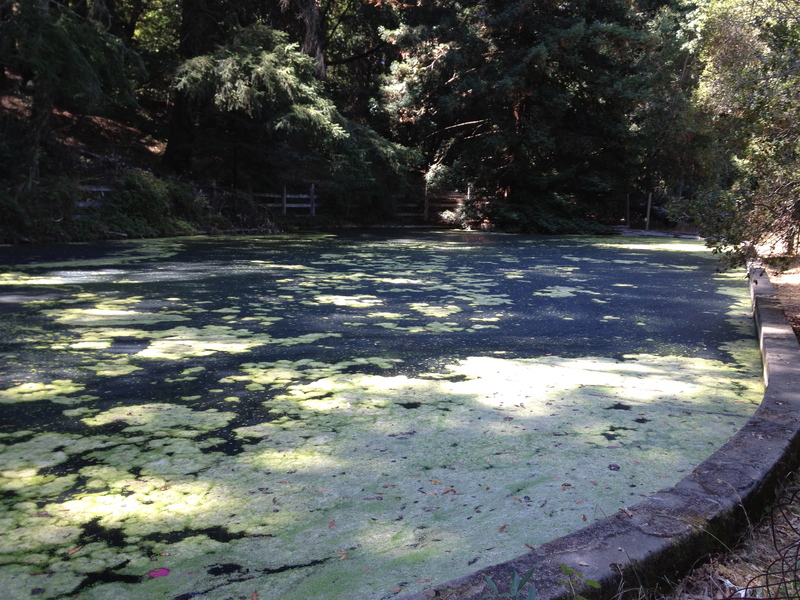 Wunderlich park has been a part of various ranches and homesteads since 1840 including Canada de Raymundo Rancho and Hazel Wood Farm. The Folger family, of coffee fame, built riding and carriage trails in the area. Folger built the first hydro electrical power system in this part of California using waters from Alambique Creek. Plan driving, transit or biking directions with this trailhead map, courtesy of transitandtrails.org. Continue on Woodside Road/California 84 to park entrance on your right. Thanks to the stellar Transit & Trails site, you can now plot transit directions to a lot of trailheads, including this one. So if you don’t have a car, don’t let that stop you. Get transit directions here. There is a medium size parking lot at the trailhead and museum. If the lot is full, you can park on Woodside Road, just outside the entrance.